Freckles to Toes: A Deal from Marie Veronique Organics! 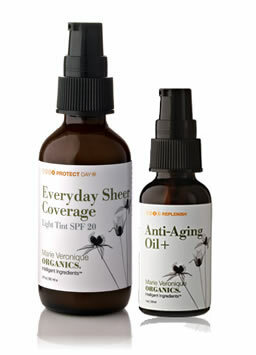 To remind you, Marie Veroniques is skin care line with an emphasis on intelligent ingredients. The content of their little bottles is a coalescence of science and nature; they implement science to address skin issues with nature's most potent ingredients. And on top of it all, they donate 10% of their profits to organizations creating opportunities for children in third world countries. Although their concoctions couldn't squeeze into one of my budget edition posts, Marie Veroniques happens to have some the best, and most frequent deals and steals. Another reason to adore them. This deal happens to be an offer they extended just for me and my friends. Which means YOU! So here's the dealio. Try Marie Veroniques best selling Desert Island Duet (which is aptly named for the only two products they would bring if stranded on a desert island) and received a FREE anti-aging mist. I've tried the Desert Island Duet, for which I really must complete a post, and it lives up to the pedestal on which I've placed Marie. Now, if you had your heart set on trying something else from Marie Veroniques (there is just so much to love), then I have good news for you! You can also use my deal for free shipping on any goods you wish to plunder. For the whole month of October, use the code CharlottesDuet to get a free anti-aging mist with a purchase of the Desert Island Duet, or the code CharlottesFree to get free shipping on absolutely anything! Happy plundering! Finding anti-aging products that work well have been hard. Marie Veroniques is an amazing resource if you're looking for anti-aging products. They have an anti-aging serum, a wrinkle serum, a hyperpigmentation treatment, under-eye serum and a rosacea treatment, and more. All are full of powerful, nourishing ingredients. Some other companies with clean creds and anti-aging lines worthy of investigation are Acure Organics, Pratima Ayurvedic Skincare and Skin Perfection. Let me know if you find any standout products!